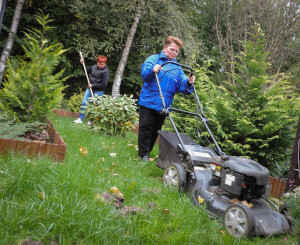 Autumn arrives and … who doesn’t need help in the garden? The trees shed their leaves, and watch it on the ground with it’s different shades is beautiful, but … if you let it there, It may form a pool of leaves until to cover your home! The same thing happens inside the houses and different establishments, rain and wind soiling the crystals, we walk with more wet shoes and muddy in some cases … In short! The interior also needs some cares! For this reason, I introduce you about a cooperative of five women (by now), called Wykon that takes care of all cleaning, both outdoors and gardens such as indoors, whether for homes, offices and different types of establishments. companionship to elderly and sick people, in addition to it’s many other offerings. The cooperative is located in Pobiedziska (near Poznan), where we were last week for visit them and know more about their activity and needs. In this picture, you can see part of team. For example, Agnieszka, the last on the right, who is the president and manager of the social cooperative, and the other women, are two of the fabulous workers who give their best to care of places and people, leaving everything full of harmony. *Remember that being a cooperative, if you make hiring, somehow, you are contributing your bit in improving the social economy and the common good, so animate to participate and disseminate!